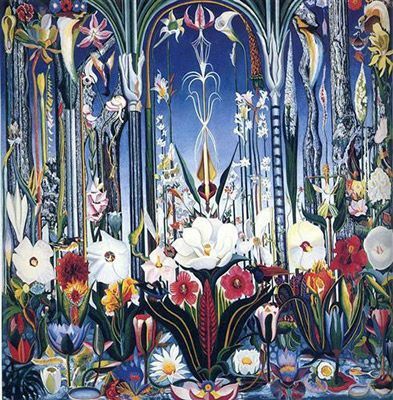 The below artworks are the most important by Joseph Stella - that both overview the major creative periods, and highlight the greatest achievements by the artist. 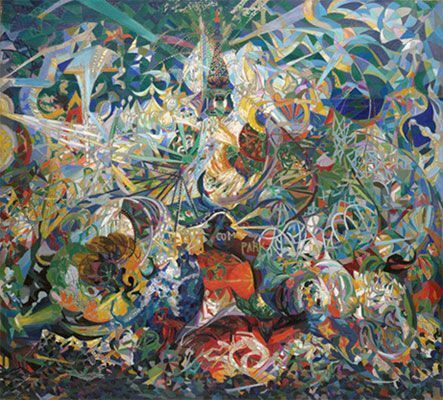 Artwork description & Analysis: Stella began this abstract rendition of the sights and sounds of Coney Island in late 1912, after returning to the United States from Paris. 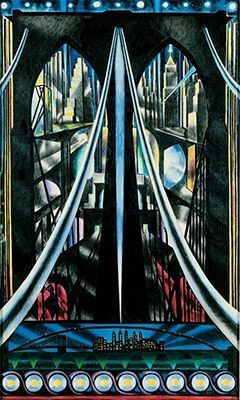 It was his first work in the Futurist mode, and is an excellent example of the ways in which he utilized the techniques and ideas of European modernism to capture this quintessentially American scene, depicting New York's iconic roller coaster at Coney Island. Stella was captivated by the amusement park, describing it as an "intense arabesque" with its "surging crowd and the revolving machines generating... violent, dangerous pleasures." Forms are fractured and faceted to create a fragmented, kaleidoscopic vision of roller coasters, spinning rides, and colorful buildings, all disembodied by light and bright hues. 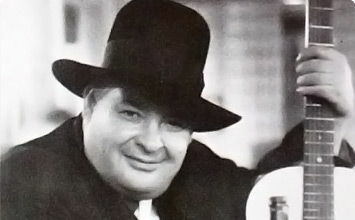 Glimpses of signs allude to the real-life attractions of the day, such as Feltman's restaurant (where the hot dog was invented) and Steeplechase Park, which boasted a Ferris wheel, scale models of world landmarks, and a mechanical horse racing game. When this painting was exhibited in New York City, the popular reception was negative, even though art critics admired it. 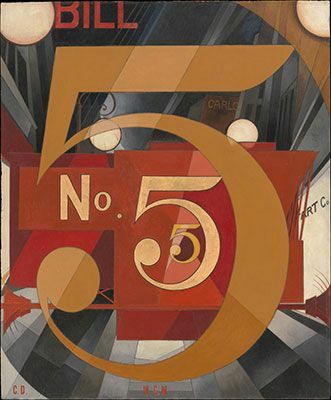 After a few years, however, it was accepted as a hugely influential work of the American avant-garde. Artwork description & Analysis: Many critics and curators of Stella's work consider this monumental, five-panel painting to be his finest work. It was something of a paean to the technological and cultural innovations that made New York one of the most vibrant modern cities in the world during the 1920s. All over the world, New York City and its celebrated skyscrapers remained an object of fascination. Artwork description & Analysis: In this painting, Stella depicts factories that extract ammonia, tar, and light oils that are released when coal is burned. Such mechanical processes fascinated Stella, and he once recalled, "Opposite my studio was a huge factory . . . towering with the gloom of a prison. At night fires gave to innumerable windows menacing blazing looks of demons." 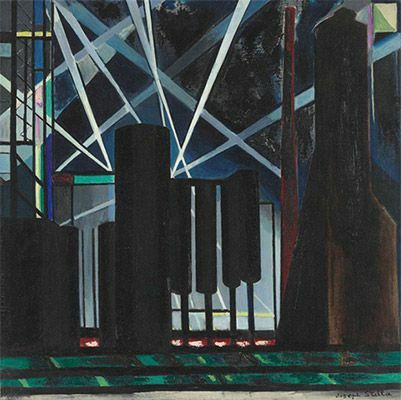 Imposing, shadowy buildings, tanks, and chimneys are interspersed with radiant, intersecting beams of light, a contrast that gives the painting an eerie, mysterious quality that hints at the complex chemical processes occurring within the factories. There is a captivating hint of danger that is intriguing but also oddly beautiful. The shining spotlights give a sense of expectation of something wondrous occurring - such as the announcement of new product release or a movie presentation. Artwork description & Analysis: Stella spent the bulk of his time in Europe during the late 1920s and early 1930s, returning to the United States only when exhibitions required it. Though the American art scene, especially New York's architecture, had long been a source of fascination for him, the traditions of his native Italy continued to draw his attention and influence his art. The 1920s in Italy saw a renewed appreciation for early Renaissance art, particularly artists such as Piero della Francesco and Giotto. 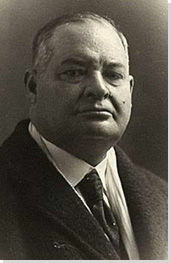 One of the leading voices of this Renaissance revival was actually Carlo Carra, the Futurist whose work had helped to inspire much of Stella's early painting. Artwork description & Analysis: At first glance, this colorful painting, depicting an enormous variety of vibrant flowers in full bloom, seems to have little in common with the inorganic, structural forms of Stella's iconic New York canvases. But close inspection reveals that it is an architectural arrangement of organic forms. The vegetal and floral forms resemble supporting piers, pillars, cables, and arches, in a construction that strongly resembles Stella's earlier studies of the Brooklyn Bridge. At the same time, the painting shows the influence of Italian art on his work, in its references to both to stained glass (in the geometric areas of distinct color) and to the architectural frames of early Renaissance paintings (in the three arches running along the top). Although the painting seems to be rigidly symmetrical, there are slight irregularities; for instance, a red dahlia on the lower left is mirrored by a different flower - a red plumeria - on the lower right. The general effect suggests symmetry, but nothing on one side exactly mirrors what is on the other side. Artwork description & Analysis: Stella first painted the Brooklyn Bridge in 1918 and returned to it repeatedly throughout his career. 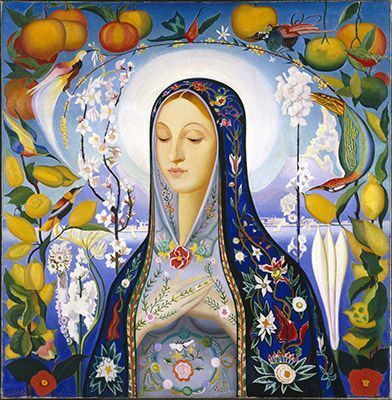 This piece, painted toward the end of his life, blends the Futurist and Cubist sensibilities of his early work with the religious undertones and saturated color that typify the paintings he produced in Europe during the late 1920s and early 1930s. The painting depicts the bridge as something of a modern-day altar; it is a place of spiritual significance. He uses crisp, angular lines to impart both dynamism and monumental solidity to the structure. The bridge's cables invoke the soaring pointed arches of Gothic architecture, and they are underscored by a rich, jewel-toned color palette that recalls the intricate stained glass of Gothic cathedral windows. The visual allusion to religious architecture gives the bridge itself a weighty, other-worldly significance. These sharply curving cables also impart a sense of energy and movement to the composition, drawing the viewer's gaze up and toward the center from both the left and right corners of the canvas. By offering a bold, bright new twist on a favorite subject, this painting perfectly illustrates the ways in which Stella's style had evolved into something more personal and idiosyncratic by the later years of his life. First published on 25 Mar 2016. Updated and modified regularly.